The house is still for sale, if you, or someone you know is interested. Mark Steyn of the Chicago Sun-Times columnizes about an interview recently between Katherine Schori and the New York Times. Could we get further from basic Christianity? ...the new Presiding Bishop of the Episcopal Church, Katharine Jefferts Schori, the first woman to run a national division of the Anglican Communion. Bishop Kate gave an interview to the New York Times revealing what passes for orthodoxy in this most flexible of faiths. 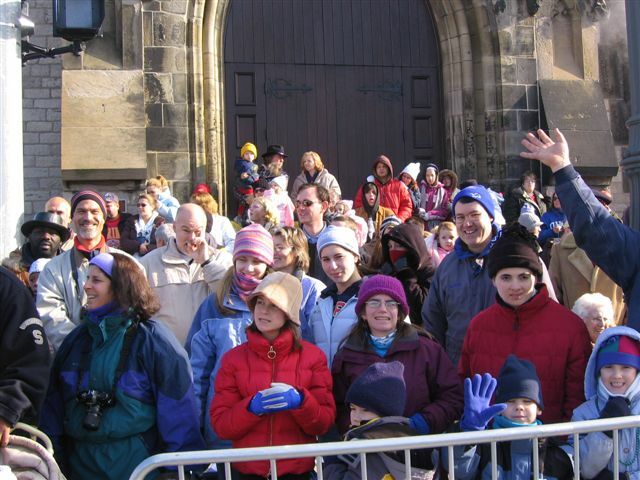 She was asked a simple enough question: "How many members of the Episcopal Church are there?" It was another great Thanksgiving at St. John's. Unlike last year's frigid weather, this year it was quite warm. The parade started an hour earlier, and closer too, so we were done earlier too! 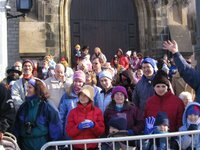 The Episcopal Church Women sold donuts and hot chocolate and coffee out the front door (it was still cold enough to drink that) and we also sold pancake breakfasts in the Undercroft. Sales were up from last year (too cold) but down from two years ago since parade got to St. John's an hour earlier. Today (Sunday) we celebrated my son Andrew's 9th Birthday. 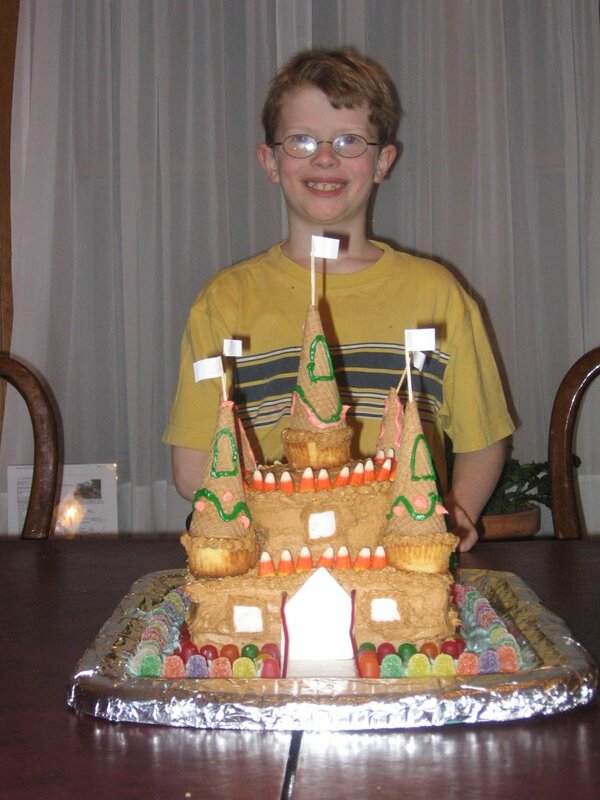 Jennifer prepared a wonderful cake for his birthday - pictured here. 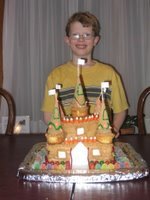 Jennifer has a real gift for being able to create cakes like this castle cake. William's cake in August was a pirate ship, and Sam's a space shuttle! Tomorrow (Monday) we celebrate my wife's ______ birthday (you didn't actually think I would publish my wife's age!). Thank God for my wife! I think no one on "Mere Comments" has commented yet on the sermons preached by the Episcopal Church's new Presiding Bishop Katharine Jefferts Schori at her investiture and installation on November 4 and 5, 2006. Maybethey're not worth much comment. They do not include predictably controversial statements (such as her reference to "Mother Jesus" at GeneralConvention 2006) but the sermons are more remarkable for what they do not say:Bishop Schori's sermons make no mention of the cross, nor of Jesus' death, nor of His rising again. Neither sermon uses the word "Gospel" (or the phrase "good news"). Neither sermon mentions Father, Son, or Holy Spirit (though the word "Spirit" does appear.) Jesus is not called Lord in either sermon; and somehow in her November 5 All Saints' Day sermon, she managed to avoid saying "Christ" or "Christian" altogether. The sermons make no mention sin, nor of hell or judgment. 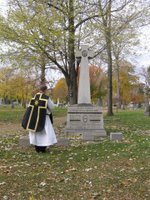 The November 5 sermon does not use the word "salvation" at all, and the November 4 sermon uses it only once, where it is equated with "our [the Episcopal Church's] health as a body"; and that usage is typical of the entire sermon: It employs some conventional Christian vocabulary, but it does so only in order to address this-worldly concerns that the Church shares with secular social welfare agencies. A believing Christian could take that vocabulary as an occasion to import his personal Christian beliefs into the sermon, but the sermon does not require such beliefs. It is, instead, devoted to a description of temporal goals, as to which there is no Christian distinctive. For example, a theme of the November 4 sermon is "home," but the sermon does not (as a Christian might) describe a future heavenly home (nor use the word "eternal" or "eternity"). Rather, the sermon aspires to a here-and-now" home that does not depend on place, but on community gathered in the conscious presence of God." The sermon speaks of a God-given "dream" of a feast at which all are"filled with God's abundance" - which the orthodox Christian might take to mean the heavenly wedding feast of the Lamb - but the sermon says instead,"We live in a day where there is a concrete possibility of making that dream reality. "The closest the November 4 sermon came to stating a resurrection hope is an oblique reference: the sermon says that we have a "hope that will notcease until that dream [of the feast?] ... has swallowed up death forever." The hearer might infer that this defeat of death is simply one of the hoped-for results of the Church's ongoing project of feeding the hungry (so that they won't starve) and healing the sick (so that they won't die). If instead Bishop Schori intended to refer to an ultimate victory over death, she failed to inform her hearers that Jesus Christ achieved this victory, and that it can be ours by grace, through faith. In fact, theNovember 4 sermon does not even include the words "faith," "belief," or"trust." The November 5 sermon did use the word "faith" in describing the saints as"the heroes of our faith," but it did not suggest who or what is the objec tof that faith. The sermon is devoted exclusively to "abundant life in service to the world," to a "shalom" that is "at least partially realized in our own day." In an inversion of the Biblical images, the sermon proposes that "a new heaven, a new earth, a holy city, a new Jerusalem" will be foundin "this place we call home." Perhaps the sermon intends to refer to eternity, or heaven, or the resurrection when it anticipates a time "when all peoples and all creatures have come home at last," and the sermon includes a reference to "the end of all things"; but it gives no hint of what that end will be, nor how one canenjoy blessedness in that end. Someone who is being installed as Presiding Bishop has the wonderful opportunity and responsibility of delivering sermons that will be heard and read by people all over the world. Given this opportunity, imagine what theApostles Peter and Paul would have said.Their preaching and teaching in the New Testament makes it clear thattheir sermons, delivered on such an occasion, would have confessed Jesus Christ as Lord; would have spoken of His death on the cross and His resurrection; would have explained that eternal life comes through Him; and would have invited the hearers to repent of sin and put their faith in Jesus Christ. But the religion of the Apostles is a religion very different fromthe one on display in Bishop Schori's investiture and installation sermons. After a week away, it seems as if two weeks worth of work is waiting (after doing two weeks worth of work the week before you go away). 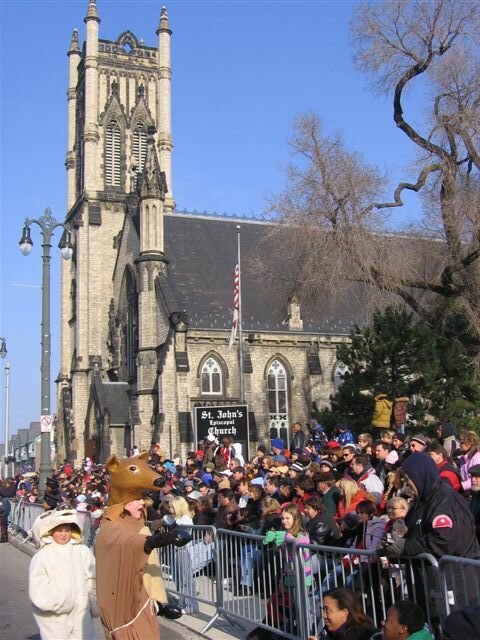 And this week has been hectic gettting ready for the Thanksgiving service, sleep-over, and pancake sales for the Parade! But the Church building has fallen victim to the lastest crime spree. The cooper downspouts (which were painted to look like lead/tin) were all stolen, from about 8 feet downward in the past 3 weeks. Copper thefts have become epidemic with the price of copper sky-rocketing from 75 cents a pound to over $4 a pound at one point. Theives are striping utility poles of wires, and stripping the copper wire out of air-conditioning units. The old Mounted Unit barn at Bethune, between Woodward and John R was broken into and plumbing and wires stripped from the building. City Council and the State legislators are moving on legislation to cut the 'urban miners' off at the supply...making it tougher to sell to scrap dealers, and making them accountable for the source. Today in the Detroit News we hear of a large bust at a house full of scrap thieves, with officers and the commander from my own Central District featured prominently in the article! Chaulk one up for the good guys! DETROIT -- As city and state lawmakers push for measures to crack down on copper theft, Detroit police on Tuesday raided an abandoned house on East Bethune where nine squatters were stockpiling metal stolen from nearby buildings. The seven men and two women were found in the filthy, debris-strewn three-story house watching television sets powered by stolen electricity tapped from DTE lines. Police also discovered a man in an upstairs bedroom injecting drugs. "He said he was from Bloomfield and he asked if we could allow him to finish getting his fix," said Commander Frederick McClure. McClure said a neighbor tipped police to the activity in the house. Churches, homes and a vacant police precinct have been hit by thieves as copper prices soar. The squatters will face charges ranging from entering a home without permission to receiving and concealing stolen property. On Tuesday, state Sen. Buzz Thomas, D-Detroit, introduced a bill to increase penalties for copper theft. The Detroit City Council will vote today on an ordinance to crack down on metal theft, including the licensure of junk collectors . Junk dealers and scrap yards would also have to keep detailed records of whom they are buying metal from and keep video surveillance of transactions. A hearing Tuesday attracted a dozen scrap collectors who said increased regulations and fees would drive them out of business. "It's too much," said 66-year-old Joe Antolak. "They need to get more police out there." But Councilwoman JoAnn Watson said the regulations are needed. "Something has to be done," Watson said. "Citizens are demanding it." The priest mentioned in the Article, Fr. Richard Swan, was a student at Nashotah House when I was there. Pray that all Bishops come to realize it is THE Faith to which we acquiesce, not something to make up and change as we go along to suit our own desires! JACKSONVILLE, Ill. -- On his annual visits to confirm newcomers to Springfield parishes, Bishop Peter Beckwith spares no words to warn his flock that the Episcopal Church is falling apart--succumbing to secular values in the guise of modern faith. "There's only one truth, and our challenge is to discover it," he said in a recent homily at Trinity Episcopal Church in Jacksonville, the oldest of the diocese's 40 parishes. "It is revealed to us." This unwavering view of Scripture divides Beckwith from the majority of the Episcopal Church and its new leader, Bishop Katharine Jefferts Schori. But Beckwith refuses to sacrifice his integrity to hold together the relationship. He does not compare the possibility of schism to divorce. In fact, he likens it to fidelity. "I'm married to the gospel, the Anglican Communion, the authority of Scripture--and I've got this prostitute putting the moves on me," he said, intending a reference not to Jefferts Schori but to her theology. Throughout this rural Illinois diocese covering 60 counties, many parishioners and priests side with their bishop. Others are accustomed to his hard-line position and do what they want anyway. Some say they will discuss differences only with Beckwith, preferring not to air their disagreements. "Episcopal means `of the bishop.' How can you be against the bishop and actually say you're Episcopal?" said Rev. Richard Swan, a priest who oversees six parishes in a predominantly Baptist region where many parishioners have struggled to make ends meet after many area coal mines closed. "We have a bishop who takes his vows very seriously as to the part where a bishop is to guard the historic teachings of the Episcopal Church." A former military chaplain, Beckwith's experience in the armed forces fuels his ministry. "The best lesson in the military is you learn it's not about you," he said. "It's about the mission--mission accomplishment whatever it takes. ... To me, that's so close to Christian vocation. It's about the mission of the church." As those who were at Church last Sunday know, my family and I are out of town this week. We are staying at Jennifer's sister's house in Georgia, 15 minutes from downtown Chattanooga, Tennesse. We will be out of town, and mostly out of touch, until late Friday evening. Jennifer and I were Godparents to my nephew Seth at Sunday's baptism at St. Paul's Chattanooga - a parish made famous by the great love for it by our own parishioner Henry Aldridge (who will tell you he is technically and emotionally still a parishioner at St. Paul's). It was a very handsome building and the liturgy pretty well done (for Rite II in the new prayer book), and my brother-in-law even convinced them to use incense - a rarity here apparently. There were 3 baptism taking place, bringing lots of guests and filling up the Church so that there were people in the balcony! The Nave is a little more than half the size of St. John's, and I look forward to the days in the near future when St. John's is so full! I also had a chance to return for Evensong (no where nearly as full), and in chatting with the organist found out he is an acquiantance and great admirer of our own Dr. Huw Lewis! They have a nice Cassavant Organ, the same company that built our organs at St. John's. But as nice as it was to be there and to worship with family (many were in town for the baptism), I spent the morning glancing at my watch and saying to myself, "the 8am serive must be finishing up now at St. John's", or "I wonder that costumes the kids are wearing for I sing a song of the saints of God", or "they are probably receiving communion at the 10am Service now at St. John's" and of course longing to be home with you all! It was great to have so many people at tonight's Choral Requiem Mass, with the Choir singing Faure's Requiem. It was just beautiful. 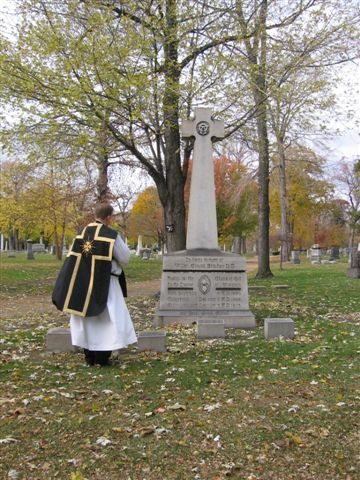 It was also inspiring to have the other two Masses "among the dead". 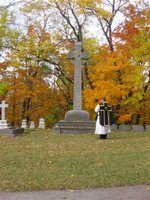 The first Mass was at Elmwood Cemetery, where the majority of our parishioners are buried. Mass was in the Chapel, and afterwards we went over to the graves of our Founders, Henry Porter Baldwin and his wife Cornelia, as well as the grave of our first Rector, Fr. (later Bishop) William Armitage. Both have many children who died in infancy buried with them, as well as the adult children and spouses of Governor Baldwin. Fr. Armitage's surviving child is buried elsewhere. 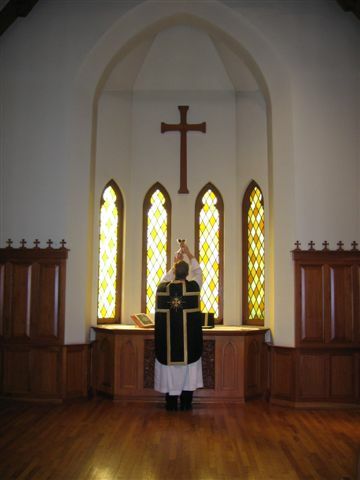 The Second Mass was in the Chapel, where we have our Columbarium Chapel. 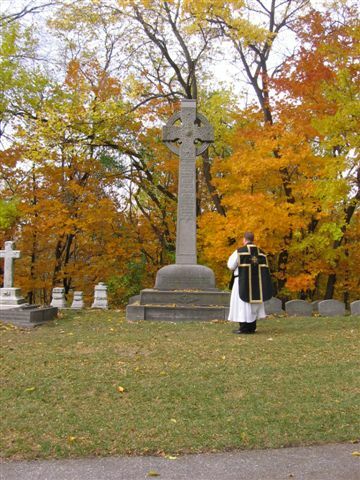 Here is buried our 11th Rector, Fr. Frisby, as well as many other parishioners from years gone by, several of whom I have interred there. It was also a good day, one of joyful memories mixed with sorrow over loss concerning those who have died recently. In particular I prayed today for the repose of the soul of Fr. John M. Scott, who mentored my vocation to the priesthood. I also remembered in my sermon Phyllis Likas, who would have LOVED this year's Tiger Season (she was buried in her Travis Fryman Tiger Jersey!). Phyllis hated the High Church in me, but loved me anyway and I her. I miss visiting her! The top photo is the chapel at Elmwood Cemetery. The second photo is at Bishop Armitage's grave (I would like to be buried here). The third photo is of Governor Henry Porter Baldwin's gravesite. May their souls, and the souls of all the faithful departed, through the mercy of God, rest in peace!